Known as India’s breadbasket, the Punjab region of India is rich with wheat fields, rice fields, sugar cane and vibrant yellow mustard blossoms. It’s famous for the tandoor and delicious yet deceptively simple dishes that are a joy to cook and even better to taste. Punjabi food is a celebration of flavour, life and love. It is steeped in history and culture, delights the senses and has the power to bring people together, no matter what their background or differences. 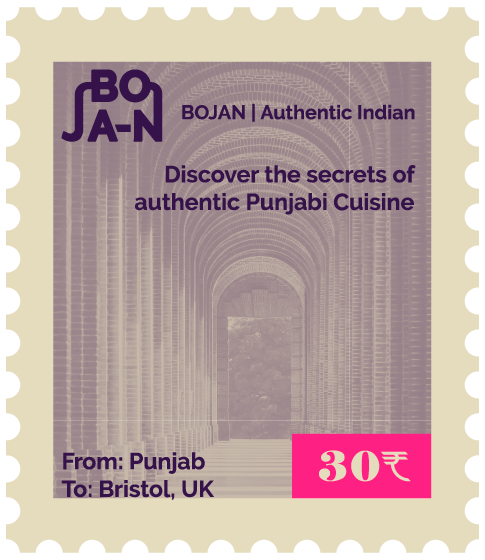 Bojan brings the cuisine of the region to a wider audience, through cooking classes, supper clubs, catering services, mobile street food and kitchen take-overs. Bojan is a play on the word ‘bhojan’ usually used in the context of asking people if they have eaten. My love for feeding people began at the tender age of eight, when my Mum enlisted me to help her prepare meals for family and friends. The kitchen was a riot of colour and aromas; fragrant garam masala, colorful spices and freshly cooked roti and parathas filled the room. I would watch with wonder as sticky dough transformed before my eyes and was placed in the middle of the table for all to enjoy. Growing up, food played a big role in my life. My siblings and I would think nothing of walking into the neighbours’ houses to share meals, and they would do the same. There was always a story to be told, lots of laughter and plenty to eat. To this day, the way I show someone I love them is to cook for them. After spending years working in finance, I decided it was time move away from the corporate world in favour of something I was really passionate about. 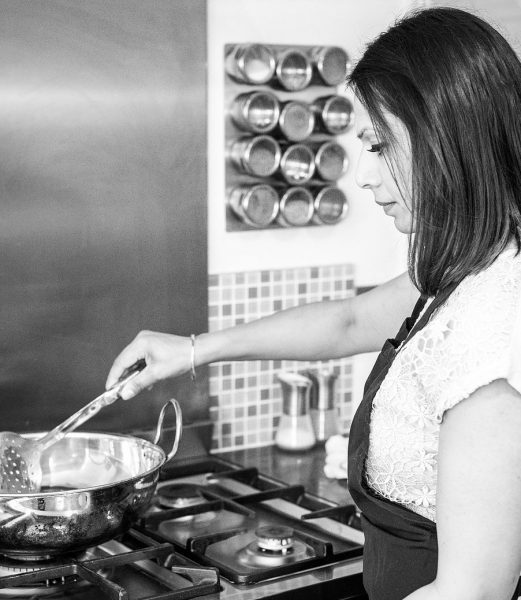 I set up my cooking school to share my genuine love of authentic Indian cuisine, using natural ingredients that can be found in any supermarket. People are often amazed by how accessible and healthy real Punjabi food is, and you’ll never find a jar or processed foods in my kitchen. I also run regular supper clubs from the comfort of my home, where you can get to enjoy 3 courses of tantalizing Indian food cooked right in my kitchen. Supper clubs are a fun and informal way to meet other people who share your love for all things food! Get in touch to find out when the next supper club evening is taking place – click here. 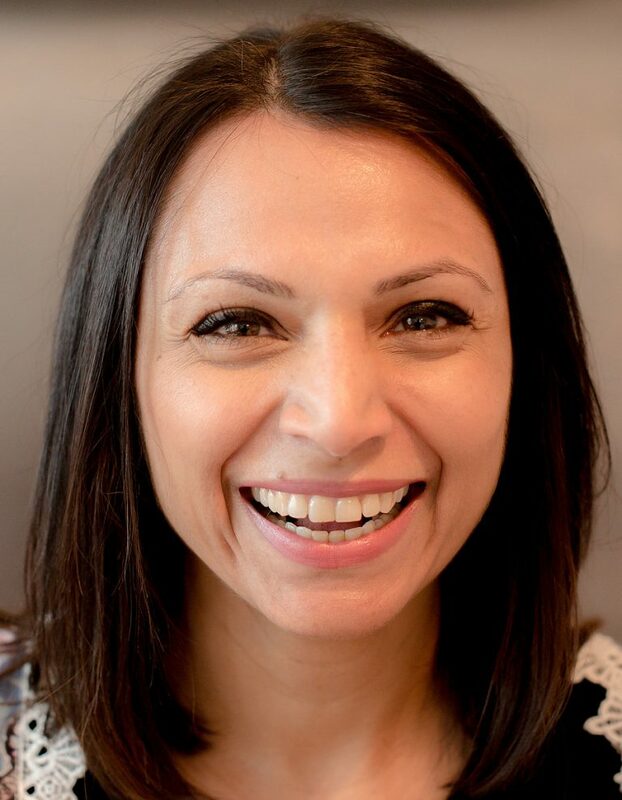 If you’ve ever wondered how to create authentic, healthy Indian dishes for yourself or simply want to enjoy some delicious, fresh flavours, I would be delighted to share my secrets with you. 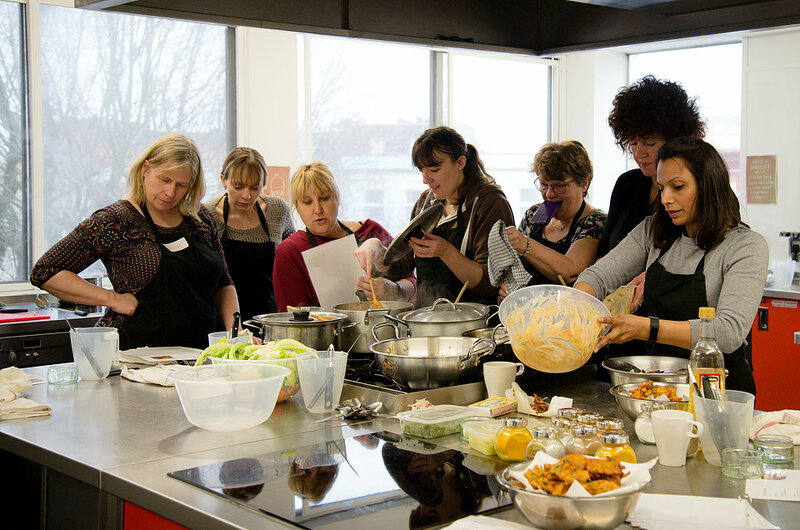 Our cooking classes are not just demonstrations. 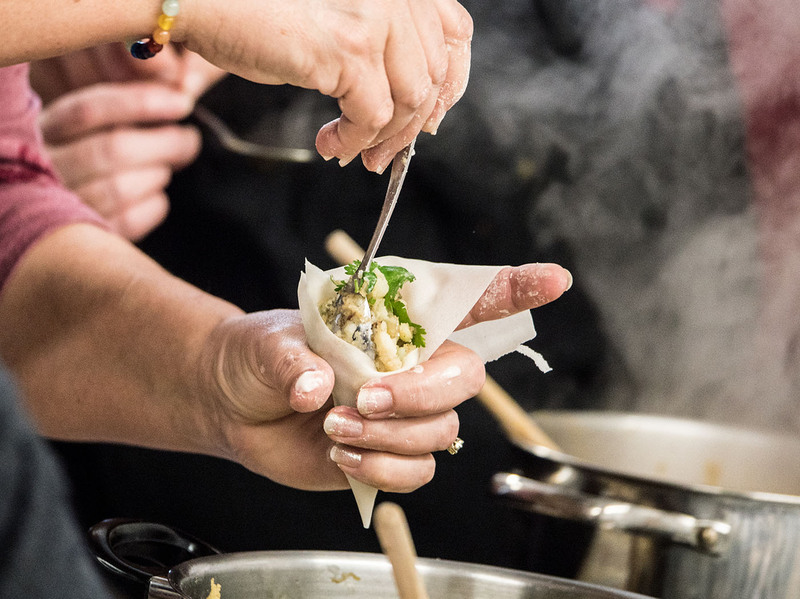 They’re hands-on, interactive, fun sessions where students are guided through each dish and selection of ingredients; learning how the flavours complement each other and come together to make authentic dishes. 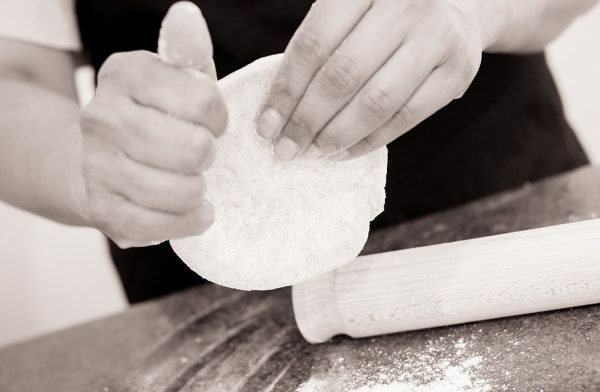 We cater for all levels of experience, so whether you’re an experienced cook looking to expand your repertoire or a total novice, there’s something to suit your needs. Each half day class will guide you through what spices you need to take your ingredients to the next level. 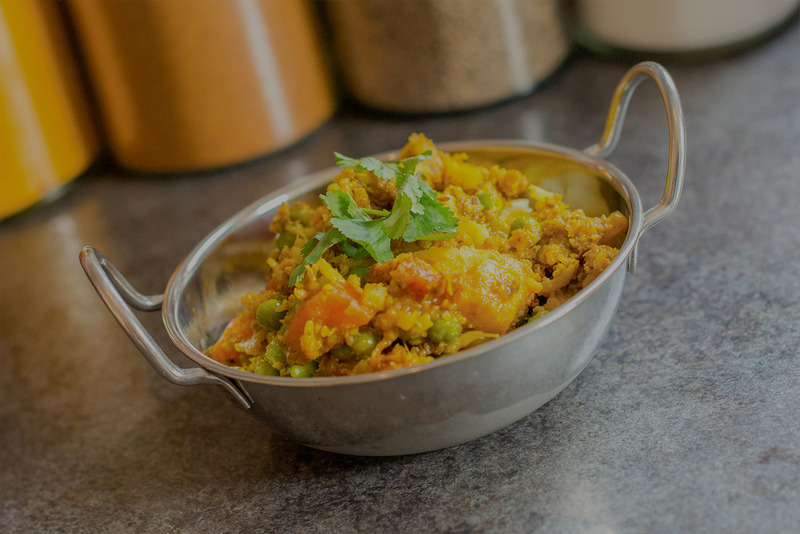 You’ll get to taste and take home the fruits of your labour, and by the end of the session you’ll have the confidence and inspiration to cook real Indian food for yourself and others. Once you know how easy, affordable and healthy it is to create tasty food at home you’ll never order a takeaway again. Every dish made in our kitchen is packed with flavour and far better for you than anything that delivery services can offer. They’re also much easier on the bank balance – traditional Punjabi dishes cost a fraction of takeaways. All ingredients and equipment is provided – just bring yourself, enthusiasm and a smile! Bojan courses are hands on, interactive and a lot of fun! 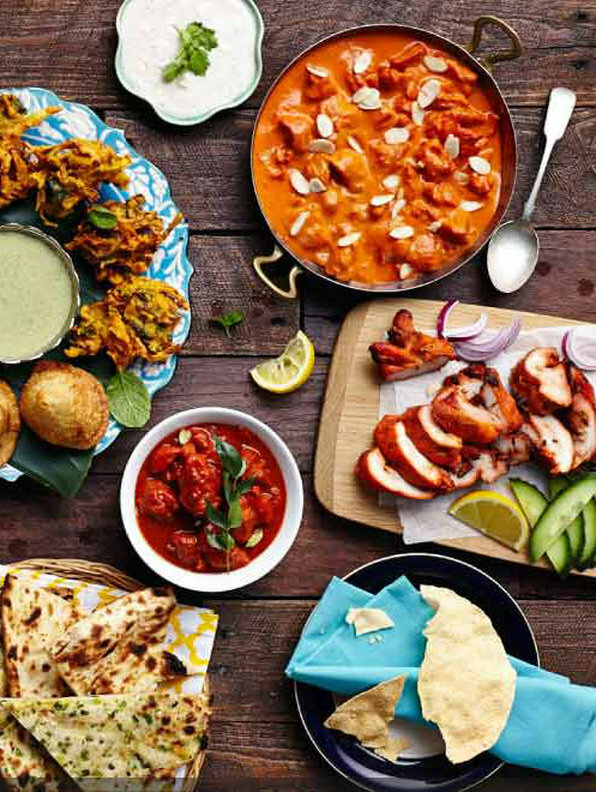 Learn how to create deliciously authentic Indian food using ingredients you probably already have in your store cupboard. This introductory class will teach you all the basic skills and techniques that you will ever need to make a truly cracking curry from scratch. No jars, no pastes, just simple, good, honest ingredients.The class will also introduce you to the main spices used in Indian food, taking you on a Spice Tour which will tantalise your senses and inspire you learn more. You’ll get to know each spice through taste and smell and also learn how versatile they are, so you can use them in all your cooking at home – not just Indian food. You’ll also get to make tasty chapattis and enjoy them fresh from the oven. 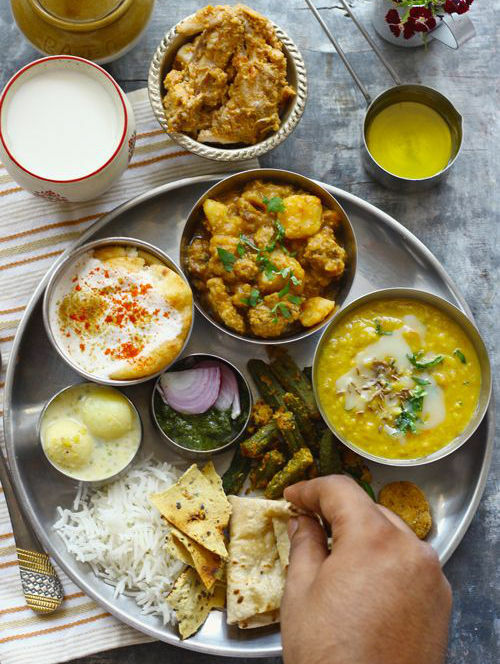 Indian cuisine is a vegetarian paradise – and the best thing is that you don’t need to be a vegetarian to enter it!Indian cuisine offers a paradise for vegetarians. India as a country is abundant with vegetables, grains and pulses, which remain the staple part of the resident Indian diet to this day. Whether you’re conscious about protecting the environment and animals or you simply want to add more strings to your bow with healthy, delicious food, the Vegetarian course has lots to offer. 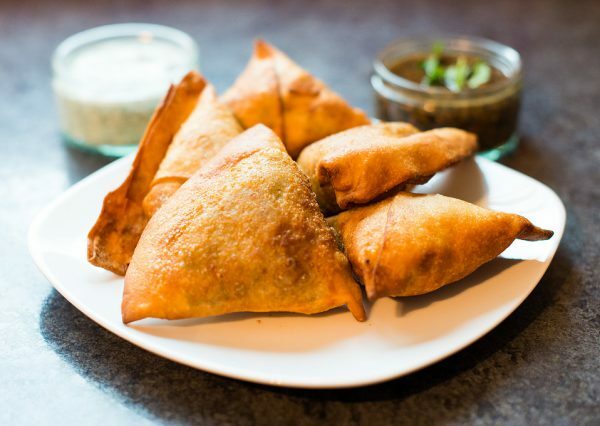 The menu for this course includes vegetable pakoras as the starter, followed by chana puri; a delicious chick pea curry, served with crisp unleavened deep fried bread – often referred to as ‘bhatore’. Finally, you’ll get to make saag aloo – taking a traditional British favourite to a whole new level of taste and colour. Take your culinary skills up a notch The advanced class builds on all the skills learnt during The Basics session, allowing you to develop your Indian culinary skills even further. You’ll learn how to create more complex dishes involving a wider range of spices and ingredients, giving you the confidence to experiment with your own recipes at home. This class is for true ‘connoisseurs’ who want to experience a wider range of Indian cooking and really hone their skills. If you want to host the kind of dinner parties that talk about for years to come, the advanced class is for you. During the session you’ll get the chance to cook parathas; a traditional bread stuffed with various fillings that is a staple part of Punjabi cuisine. You’ll also make a delicious, traditional biryani and learn some more technical cooking and timing skills. On every street corner from Jalandhar to Amritsar in Punjab, you will find an array of bustling food stalls that fill air with wonderfully intoxicating aromas. This is where locals gather to chit, chaat and chai! It’s busy, noisy, colourful and friendly, and one of the best ways for visitors to sample true Indian culture. Every region boasts its own specialties with their own unique flavours and textures, so the options are endless. Our travelling street food menu is the perfect way to get a real taste of authentic Punjabi food on your doorstep. Sample the rich aromas, colours and flavours of authentic street food including handmade pakoras, samosas and tarka daal. Street food is the easiest (and we believe, tastiest) way to try the best of what India has to offer. Our favourite street eats will show you that there is more to Indian cuisine than just curries and fluffy rice. Bojan’s take on Indian food is different. 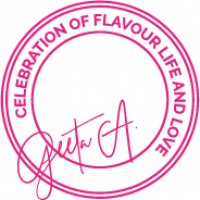 Our emphasis is on flavour, through carefully balancing and layering of spices. Our food won’t ever burn your palate due to the heat of the chillies used; instead you’ll experience levels of taste through the spices used that come together gently, allowing you to experience ‘real’ Punjabi food – the way millions of Indians do everyday. All our food is cooked using natural and healthy ingredients. We only use olive oil too– gone is the heavy ghee (clarified butter), saving on calories without compromising taste. 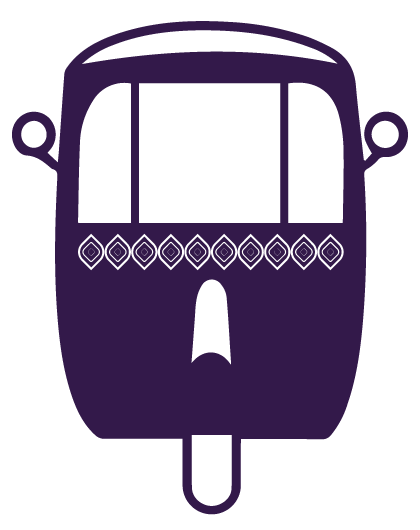 Our street food menu is available through a number of pop up locations, street fairs, food markets and Supper Clubs. Visit us at one of pop-up locations, festivals, street fairs or supper clubs.